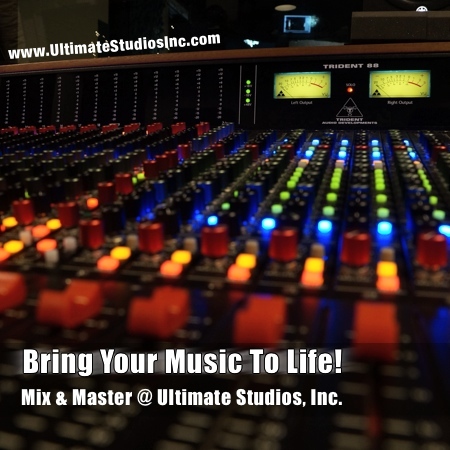 Bring your songs to life with Mixing & Mastering at Ultimate Studios, Inc.! Everything is processed by a combination of new digital technology and vintage analog greatness! All your tracks will run through an awesome sounding analog console and a rack full of analog compressors and eq's. Each one of your songs will be given the attention they deserve! Charlie believes there is simply no better way to get width and depth than using analog circuitry and Ultimate Studios, Inc is outfitted with a fantastic sounding 24 channel 72 input Trident 88 console. Countless classic albums have been recorded and mixed on Trident consoles. Yours should be next! Every mix is a personalized, custom, job tailored to fit your music! "I’ve never worked with anyone before this that can get exactly the sounds you ask for. Somehow I can say, “can you make it more orange” and up comes the sound I’m looking for." Get access to great sounding analog gear to help finish your mixes off! Group Stem Mixing is great if you already have a mix that you like but need some help getting it to jump out of the speakers. You know, like the major labels do. We can take your group stems (drums, guitars, vocals, bass, effects, etc..) and run them through the console and our rack of outboard gear to really make your songs pop out of the speakers. Mastering is the final stage before your songs are released to the wild. Our philosophy on mastering is not to try and make our "stamp" on the sound. It's to make your songs work together. You've already spent time getting the mixes the way you want them to sound (especially if we've mixed your tracks!) so all we try to do is make sure everything works together. The song, your songs, are our masters and we only do what they need. Your songs will jump out of the speakers! We promise! Contact us for more information and a quote! "I love working with creative, passionate people. 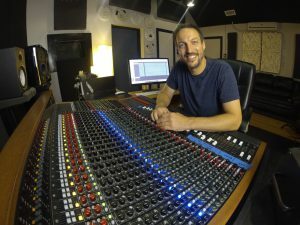 My goal as a mix engineer is to get inside an artist's vision and help bring their songs to life exactly as they hear them." says Charlie. Achieving a truly engaging mix can be a daunting task. After all the time you've spent working on your songs, you deserve just that: a truly engaging mix that brings your artistic visions to life. That's exactly what we do at Ultimate Studios, Inc! With an ear for sonic detail and a combination of digital and analog mixing styles, Charlie will assist you in getting a mix that brings out the energy and emotion in your songs. No matter what style of music you write or what part of the world you live in, mix engineer Charlie Waymire will get the job done...well! Please feel free to contact us if you have any questions! We also offer full Recording Services, Music Producing and awesome Drum Recording too! **A 50% deposit is required for all mix & master sessions. Final payment is due upon completion but before revisions. **Prices are a flat rate. **Complete mixes will be scheduled once the deposit has been received. **Stem mixes can include up to 6 stereo stems (i.e. drums, bass, guitars, keys, vocals, etc..). ***Mastering includes Full Mix and Instrumental mix delivered at .wav files. What mixing and mastering converters are you using. Couldn’t find it on the website. We use Apogee and UAD for mixing and mastering and MOTU for the recording side.